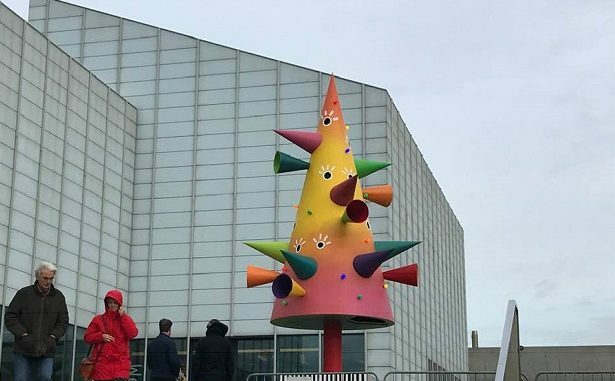 The switch on of Turner Contemporary’s artistic Christmas tree takes place tomorrow (December 1) from 4pm to 6pm. Christmas carols will be performed by Palm Bay Primary School. Mulled wine and mince pies will be available in the gallery Cafe. Joanna Tatham and Tom O’Sullivan’s colourful and playful Christmas tree installation, DOES THE ITERATIVE FIT, is a temporary sculptural and audio artwork commissioned in 2017 by The Kings Cross Project and originally installed in Granary Square London during the Christmas period. Joanne Tatham and Tom O’Sullivan produce interrogative work that questions the roles and behaviours of contemporary art. Motifs such as pyramids, standing stones and cartoon-like animals are displayed as sculpture, painting and architecture alongside performance, photographs and text.